Global demand for consumer air treatment systems will rise at a double-digit annual rate to more than $10 billion in 2019. China will account for more than 80 percent of gains, driven by poor urban air quality, a growing middle class, and increasing access to a wider variety of consumer air cleaning systems. 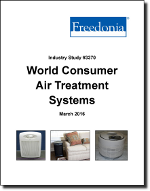 This study analyzes the $6.2 billion global market for consumer air treatment systems. It presents historical demand data (2004, 2009, and 2014) and forecasts (2019 and 2024) by type (whole-house and portable) and technology (e.g., conventional filtration, electrostatic, and ionization) for six world regions and 15 major countries. The study also considers market environment factors, details industry structure, evaluates company market share, and profiles 34 industry players, including Alticor, Royal Philips, and Sharp.